The first section of Costa's 114,500-ton, 3,780-passenger new-build was officially launched today in Palermo from Fincantieri: its bow. The 413-ft.-long section -- weighing 8,000 tons -- was launched into the sea using a slide and will be transferred by way of the Mediterranean to Fincantieri's Genoa Sestri Ponente shipyard, where construction will commence. Costa also today announced the name of the ship: Costa Pacifica. Costa Pacifica will join siblings Costa Serena and Costa Concordia as the largest passenger vessel flying the Italian flag. The ship will also boast many of the same features as Concordia and Serena, including the Samsara Spa with two swimming pools, and an authentic Grand Prix race car driving simulator. 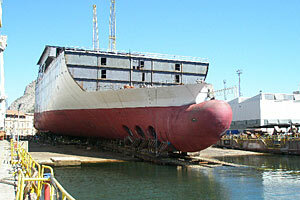 Costa Pacifica is scheduled for launch in the spring of 2009. Two other ships under construction -- the 92,700-ton, 2,828-passenger Costa Luminosa and its as-yet-unnamed sister ship -- will be delivered by the Marghera shipyard in the spring of 2009 and March 2010 respectively.